These free chicken coop plans will help give your chickens a nice safe home where they can flourish. A good chicken coop will make your chickens happy and laying lots of eggs. Building a chicken coop is a fairly simple weekend woodworking project. The free chicken coop plans below include blueprints, material lists, and building instructions, making it an easy and low-cost option over buying a chicken coop. This free plan will help you build a small chicken coop that's perfect for your backyard. It's a 6x3 raised coop with an outside area to keep your chickens active and happy. 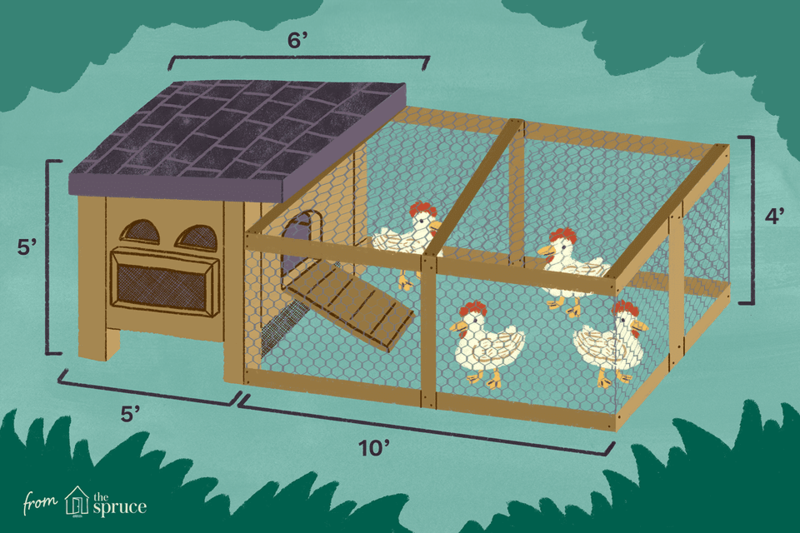 Photos and diagrams, along with a very cool infographic, will help you build this chicken coop. Here's a free chicken coop plan called "The Palace" that may be small in size, but is big in style and function. It would look great in an urban environment but also be right at home in the country. Lots of photos, diagrams, and blueprints will get you started building this chicken coop palace in no time. Lady Goats has designed this free chicken coop plan based on a $2,000 one from Williams Sonoma. You can build it yourself for much less. This small chicken coop has a run with a green roof and would fit into the smallest of backyards. Building instructions and lots of color photos will help you turn this dream chicken coop into a reality. The Home Depot has a free chicken coop plan that mimics the classic red barn. 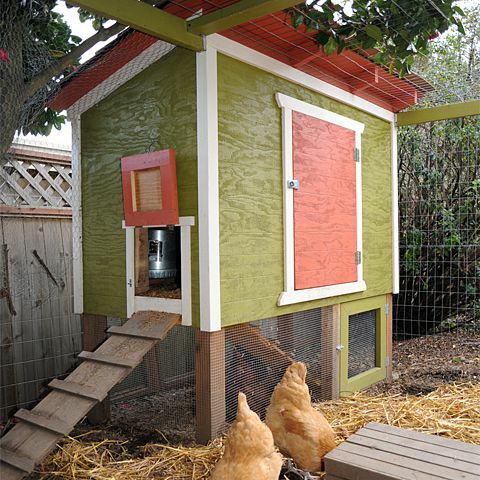 This smart design makes it 32 square feet and able to hold up to 12 chickens. Included in this free chicken coop plan are a materials list, tools list, and step-by-step building instructions with corresponding photos and diagrams. Ana White has designed a free chicken coop plan that's made in the shape of a basic shed. It has two doors (one human-sized and the other chicken-sized), a window, and a nesting box. The plan includes a shopping list, building instructions, diagrams, color photos, and user-submitted builds based on the plan. This free chicken coop plan is for a stationary chicken coop that's very easy to build and quite weather resistant. Click on the link in the How to Use This Coop section that says Chicken Coop Blueprints and Plans to open a PDF file of the free chicken coop plan. The PDF includes a material list, building instructions, and blueprints. You'll be able to house eight chickens with this free chicken coop plan with extra room for storage and a hatchway. This free chicken coop plan includes lots of details including plans from all different sides, details about measurements, a material list, nesting box plans, and information about how to install ventilation. Downeast Thunder Farm has a lovely free chicken coop plan that builds a 4x8 chicken coop that includes a yard, run, clean outdoor, and electricity. Download the free chicken coop plans as a PDF file for blueprints. There are also plenty of construction pictures to help you out. This free chicken coop plan is super easy to put together because it's primarily made out of PVC pipes. There are three different styles of PVC chicken coops available here including a smaller option that would fit in a backyard. The woodworking plans at MyOutdoorPlans are easy to follow along with because they provide exploded, detailed views of, in this case, a chicken coop. This chicken coop measures 72" long and 48" wide. It should take less than a day to build. If you're looking for a budget-friendly chicken coop to build, this free plan can be used to build one for under $100. As an added bonus, it's even portable. This free chicken coop plan includes a shopping list, tool list, written instructions, diagrams, and photos. You can also see other people's comments and photos who have used this plan to build their hens a haven. This chicken coop will hold 18 chickens who will have access to a fenced area, an indoor area, and nesting boxes for 3 hens. This very detailed DIY chicken coop plan includes diagrams, videos, and a cut list. It will take you through each step of building the chicken house including how to build the nesting boxes, perches, litter tray, run, and much more. This portable chicken coop plan will make a quick day project because it incorporates an already built barn-style doghouse along with fencing to create a haven for your chickens. The price is right too, with the material list coming in under $100.